In the American Revolution the American attack on the Royal Navy’s Gaspee was the first planned military attack against the English. Both the English Attorney General and the Solicitor General called the 1772 capture and burning of the English Navy ship Gaspee “treason” and an “act of war.” For English historians, Joseph Bucklin’s deliberate shooting of the English Navy ship captain was the first shot in the American Revolutionary War! King George III issued a reward of 1000 English pounds to anyone giving information leading to the arrest of the person who “dangerously wounded” the ship captain. It was after midnight on June 10, 1772, and no moonlight existed on Narragansett Bay, where the Gaspee, an English Navy schooner, had run aground. Then and there, over a hundred men, in ten large boats, had silently approached and now were trying to board and capture the Gaspee. 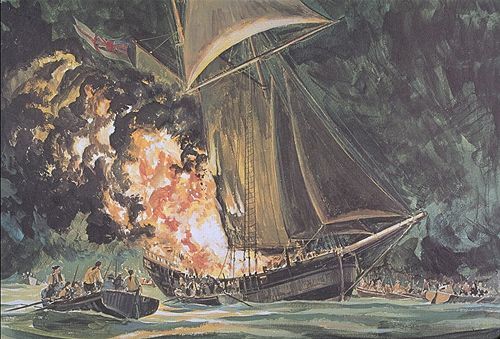 In one of the boats, a few yards away from the Gaspee, by dim starlight Joseph Bucklin could see the vessel’s commander on the starboard gunwale, swinging his sword and preventing the American attackers from boarding the Gaspee. Bucklin fired. The captain of the English ship, Lt. Dudingston, fell back on the deck, with a terrible wound in the femoral artery in his groin. The colonists boarded the schooner, and took its crew prisoner. Joseph Mawney, a doctor among the raiders, together with Bucklin, tended to Dudingston’s wounds, saving Dudingston’s life. The raiders with their prisoners rowed away, leaving one longboat for the leaders of the American raiders. The leaders carefully set the English Navy vessel on fire, before themselves leaving, just as dawn came. The English Attorney General gave King George the legal opinion that the Gaspee raid was treason, and the deliberate shooting of the English ship captain was an act of war. The American Revolution had started! The English King proclaimed a £1000 reward in the American colonies for information leading to Joseph’s arrest for treason. Rhode Island protected Bucklin and his family. The Rhode Island government and the people of Providence banded together. No one told the King’s Royal Commission or the English forces who had shot Lt. Dudingston. Why did this attack occur? Who was involved in the planning? How many Americans were in the attack force? Those are the sorts of questions answered at this site. Use the links in the left margin to several pages of describing and the events that involved, affected, or resulted from, the Gaspee attack. More extensive information on the capture and burning of the Gaspee. Analysis of the known facts – forensic history. More of the background of events before the raid on the Gaspee. Full text of the accounts by eye-witness to the events. List, and individual biographical information on each of the known persons in the boats that attacked the Royal Navy ship Gaspee. Description of the construction, armaments, and crew of the Gaspee. Number of men in the attacking American force, and the number and type of boats involved. The colonists use of law and the courts as a weapon against the English navy. In depth historical research about the event, the causes, and the aftermath. Original – first time done – research on the geography, tides, and moonlight of the attack. Research and analysis of what John Brown intended to use to justify the attack.